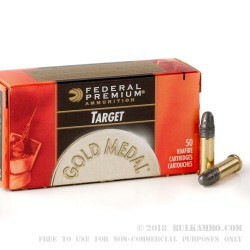 Long praised for its versatility and economy of value, the .22 Long Rifle is one of the most timeless target and varmint hunting rounds to ever be produced since its introduction back in 1887. The Federal 40 grain .22 Long Rifle Lead Round Nose is a tribute to this classic design, and one of the most popular .22 long rifle rounds to ever be manufactured in the world today. The Federal 40gr .22 Long Rifle LRN uses a classic solid lead, read nose design that is well served in both target shooting and small game hunting environments. 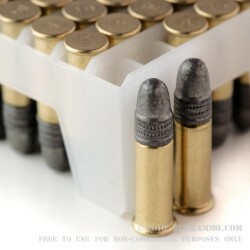 The solid lead swaged core expands faster the traditional copper and bi-metal jacketed ammunition, and works well against small game such as rabbits, woodpeckers, and groundhogs. 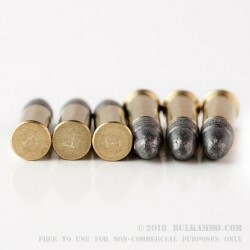 At an average muzzle velocity of 1,240 feet per second, it is not uncommon for target shooters to engage targets out to 100 yards, and the Federal 40 gr..22 Long Rifle LRN is also well suited for the Ruger BearCat and other .22 long rifle single action revolvers for building good firearm habits early on in your career. 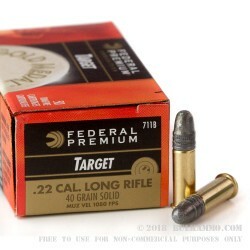 Ranchers and property owners looking for a versatile round well suited for a variety of tasks will find no better quality ammunition that the Federal 40gr .22 Long Rifle LRN.